Marinated chicken breast in a spicy tomato, coconut and chilli sauce. A taste of India Hot spiced tomato curry made with a traditional spice blend Working in partnership with expert Indian chefs we use traditional layering methods to create depth of flavour. 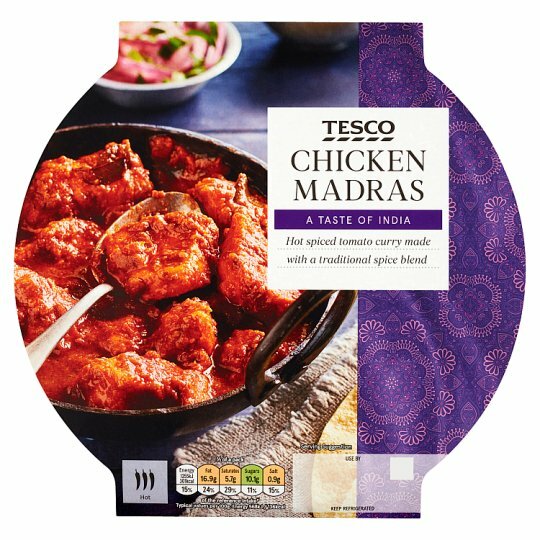 INGREDIENTS: Chicken Breast (33%), Tomato Purée, Onion, Tomato, Yogurt (Milk), Rapeseed Oil, Coconut, Garlic Purée, Ginger Purée, Sugar, Lemon Juice, Green Chilli, Coriander Powder, Cumin Powder, Colours (Plain Caramel, Paprika Extract), Salt, Cornflour, Tamarind Paste, Soya Oil, Palm Oil, Chilli Powder, Coriander Leaf, Paprika, Curry Leaf, Black Pepper, Turmeric Powder, Mustard Powder, Ginger Powder, Cinnamon Powder, Mace, Star Anise, Fenugreek, Basil Powder, Sunflower Oil. May contain peanuts and nuts.For allergens, see ingredients in bold. Instructions: For best results microwave heat. Remove outer sleeve and pierce film lid several times. Halfway through heating peel back film, stir, re-cover and continue to heat on full power. Caution: Although every care has been taken to remove bones, some may remain.Caution: This product can contain small fibres which come from the ginger purée.Caution: This product may contain whole curry leaves.